How do I Choose the Best Mycoplasma Pneumoniae Treatment? 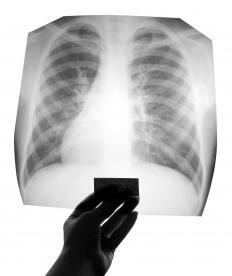 A doctor may order a chest x-ray for a patient experiencing symptoms of mycoplasma pneumoniae. If symptoms are severe enough, mycoplasma pneumoniae treatment will involve a prescription of one of these types of antibiotics: macrolides, quinolones, or tetracyclines. You can reduce fever with aspirin, acetaminophen, or non-steroidal anti-inflammatory medications, such as ibuprofen or naproxen. Aspirin should never be administered to children. Consult with your doctor before you take cough medicines, because they can hinder the ability to cough up excess sputum. Drink lots of liquids and get plenty of rest. This is an atypical variety of the disease and is produced by the bacteria mycoplasma pneumoniae. It is normally seen in people under the age of 40, and has an even higher incidence in school-age children. The segment considered at greatest risk are those living or working in crowded conditions. It has been noted, however, that many who contract this condition have no known risk factor. The signs of this type of infection are usually mild and are manifested over a course of one to three weeks. Mycoplasma pneumoniae treatment might be needed if you experience chest pain, chills, and a cough, which is typically dry. Other frequently seen symptoms include a fever, which may be high, sore throat, and excessive sweating. Symptoms that are less commonly observed include eye or ear pain, rapid breathing, and muscle aches. Complications that may result from this condition include infections of the ear, hemolytic anemia, and a severe form of pneumonia. Skin rashes may also occur. If your symptoms include fever, cough, and shortness of breath, you should see your doctor for the possibility of mycoplasma pneumoniae treatment. Although these symptoms can be caused by many other conditions, you will need to be evaluated for pneumonia. A doctor's visit will include a chest x-ray and a complete physical examination. If the severity warrants, further tests may be needed, such as a complete blood count, a bronchoscopy, and a computed tomography (CT) scan of the chest. Blood cultures may be taken and the blood may be tested to determine if mycoplasma antibodies are present. In extremely advanced cases when such tests don't produce a definitive diagnosis, an open lung biopsy may be necessary. When the diagnostic tests confirm that the condition is present, the doctor will initiate mycoplasma pneumoniae treatment. It's encouraging to know that, in most instances, patients recover even without taking antibiotics. In those who go without treatment, cough and weakness might last as long as one month. If you experience the symptoms, it's always best to be under the care of a medical practitioner. What Is the Connection between Chlamydia and Mycoplasma? How Do I Prevent a Mycoplasma Infection? How do I Choose the Best Mycoplasma Pneumonia Treatment? How do I Choose the Best Mycoplasma Treatment?